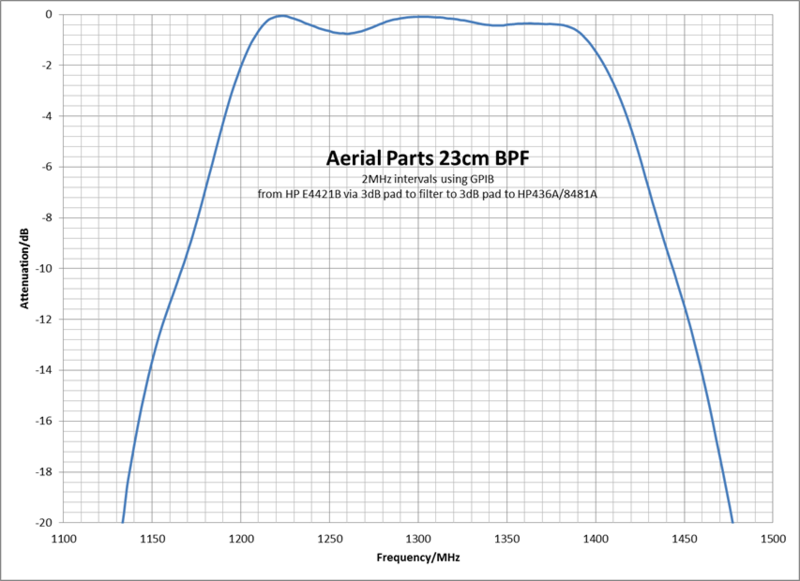 I bought a nice 23cm bandpass filter from John G3ZTR at Aerial Parts of Colchester to fix a very nasty intermod problem with very loud local signals in the 1GHz range causing mixing products with DTV transmissions from Emley Moor, 51km away. A homebrew version also worked, bit it wasn’t stiff and stable enough and really not suitable for masthead installation. Response of the filter is good, I checked the passband using a GPIB/SCPI script in Perl using my SGLabs Prologix IEEE488 to USB controller. Using the HP E4421B as the signal source, I put a 3dB pad either side of the filter as usual. Output was measures using my HP436A using 8481A sensor. I set the generator level to give 0dBm with the filter replaced with a back to back SMA female adaptor. Close-in results using this code snippet are in the first graph. Measured insertion loss at 1296.200MHz is 0.08dB, certainly well within the quoted <0.3dB at 1296. At 950MHz, measured loss is 38.9dB (quoted >35dB) and at 700MHz is it 41.6dB, again, better than the quoted figure. At the 648MHz subharmonic, it is -40.9dB.